Much fuss has been made over the past week or so about The Denver Post’s commentary section on Sunday, April 8. If you missed it, then the section that day was dedicated to essentially pleading for the paper’s life. The Post’s editorial board took the highly unusual step of writing a lengthy editorial blasting the paper’s ownership, Alden Global Capital, a New York-based hedge fund, which has in this decade cut a newsroom staff of more than 250 people to fewer than the 100 it is today. The news of the most recent 30-person cut has the paper’s longtime political critics cackling over what seems to be the beginning of the Post’s demise. We’ve also heard plenty of the now-usual cliches about the death of print media. Putting those barbs aside, we’d like to offer an argument for the value of a publication that tries to cover the entire state. The Denver Post has for decades proclaimed itself “The voice of the Rocky Mountain empire.” That’s a tough job even in the best of times. Try just driving from Julesberg to Cortez someday and you’ll get an idea of the sheer size of this state. To even try to provide statewide coverage in changing, more tightly staffed times, the Post has for the past several years forged content-sharing agreement with other newspapers around the state. 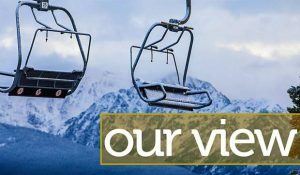 The Vail Daily, as part of Colorado Mountain News Media, owned by Swift Communications, participates in one of those agreements. Vail Daily readers benefit from the Denver paper’s coverage of federal courts, state politics and similar issues. The Vail Daily, and other newspaper groups around the state, provide the Post with news from areas outside the Denver area. It’s an arrangement that’s worked pretty well, for both participating publications and readers. Those who believe that news comes from the internet are similar to people who think their food comes from the grocery store. Someone, somewhere, is paying people to put content into print and onto websites. A healthy news business — from reporters to readers to advertisers — helps provide the information needed for a free society to function. That means consumers looking for information should subscribe to news sources, whether in print or on the web. Businesses also need to see a return on their investment in advertising. That means patronizing the firms that help support news businesses. Here’s hoping the Post can somehow emerge from its current troubles and continue to be a valued partner in our state’s media environment.